Megan Rhoades doesn’t have many smiles left, but thanks to a Springfield dentist, her remaining smiles will be brilliant ones. 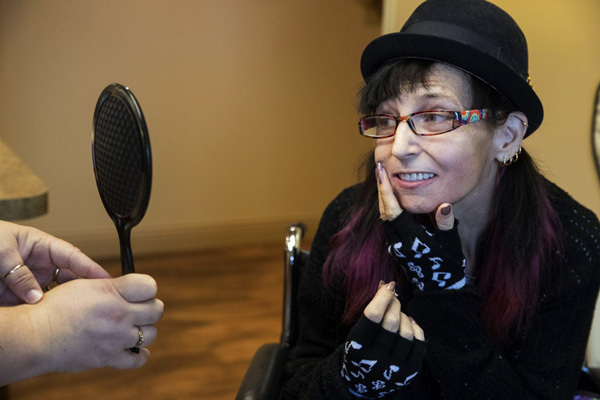 The 47-year-old Rhoades, who is under hospice care in the Jacksonville home she shares with her mother, has had severe dental problems since last year, when she fell and knocked out several teeth. An old work colleague, Dr. Keith Cummins, has been treating Rhoades for the last few months. On Wednesday, he put temporary dentures in Rhoades’ mouth; more permanent dentures will be placed in four months. The dental work, which Cummins said he’s providing free of charge, gave Rhoades a full set of teeth for the first time in more than a year. Rhoades’ story began several years ago with an infection in her stomach that couldn’t be controlled and contributed to her developing an auto-immune disease. She said surgeons removed her stomach, which caused her to develop malabsorption, a condition that limits her body’s ability to absorb nutrients from food. Rhoades also has degenerative disc disease and has suffered a stroke. Doctors say her combination of maladies is terminal, she said. Rhoades also has osteoporosis, severe pain and numbness in her extremities, and she’s losing her vision. This causes clumsiness when she tries to move and severe consequences when she bumps into things. In just the past year, Rhoades has broken her left elbow, left shoulder, right hip and nose, she said. But it was an injury to her mouth in June 2016 that proved to be Rhoades’ most vexing problem. “I tried to get up from my hospital bed and fell forward, and it knocked out my bottom front four teeth,” Rhoades said. “Because of the malabsorption, it set into motion that the rest of my teeth started losing enamel. With the enamel coming off, the infection in my mouth was going septic. 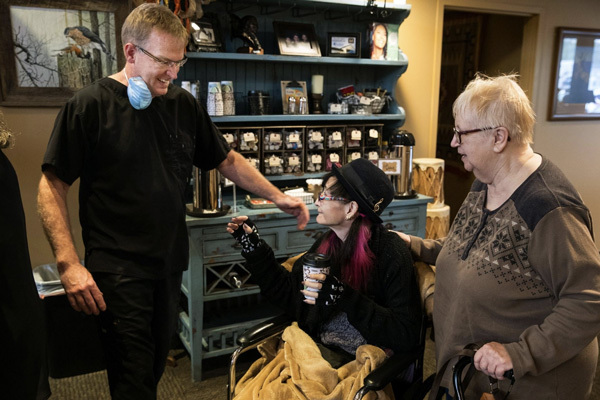 “I was already a hospice patient because of my other illnesses, but I didn’t want to die from being septic because of the infection in my teeth,” Rhoades said. Rhoades was referred to a dentist in Jacksonville to pull her teeth before the infection could take hold. But the dentist’s office was reluctant because they feared Rhoades would not awaken from the general anesthesia they wanted to use for the procedure. Plus they wanted co-payment money up front, something that Rhoades did not have. Then Rhoades saw a television commercial for Magna Dental and recognized her old colleague, Cummins. The two worked together at the Sangamon County Jail. She was a nurse. He provided periodic dental care to inmates. She decided to call and ask his advice on how to proceed. “He said, ‘I want you to come over here and let me take care of you. End of story,’” Rhoades said. Cummins removed all 24 of Rhoades’ teeth in several sessions starting this past June using a local anesthetic. He did not charge Rhoades for any of the procedures. But Cummins wanted to do more. Rhoades was overwhelmed by the gesture. Rhoades is 72-year-old Marilyn Pessina’s only child. Pessina was the first to react on Wednesday when her daughter flashed her new smile for the first time. Rhoades’ best friend for 35 years, Mary Rogers, also was there as the dentures were fitted. As he was fitting the dentures in Rhoades’ mouth on Wednesday, Cummins assured her the discomfort she felt was only temporary. Rhoades didn’t answer. She was busy admiring her new teeth in the mirror.